The United Nations has quietly removed a major Palestinian camp from its list of besieged areas in Syria, despite not being able to deliver aid there for four months, and to the shock of residents. The Yarmouk camp, a sprawling residential area on the outskirts of the Syrian capital Damascus, was home to over 200,000 Palestinians before the country’s civil war began in 2011. The vast majority of the population has since fled, but around 18,000 people have remained trapped inside by a government siege for more than two years. Earlier this year, militants from the self-declared Islamic State (ISIS) briefly infiltrated Yarmouk and seized a large part of it. Control of the camp is still disputed but government forces maintain checkpoints around the area preventing people from coming and going. The UN continues to have no direct access, but has been able, with partners, to deliver aid to three nearby suburbs. Consequently, in his latest report to the UN Security Council, Secretary General Ban Ki-Moon reclassified the camp. Ahmed*, a Yarmouk resident, said that people were still denied entry and exit and that no support had been received for more than a month. “The UN stopped its support more than 50 days ago,” he told IRIN. When is a siege not a siege? Chris Gunness, a spokesperson for UNWRA – the UN’s agency for Palestinians and the leading UN body concerned with Yarmouk – confirmed that no aid had been allowed in for months. The final decision on the status of the camp, however, is made not by UNRWA but by the UN secretary-general (UNSG) on the advice of the Office for the Coordination of Humanitarian Affairs (OCHA), which oversees all the UN’s emergency aid programmes. The latest UNSG report on Syria – released at the end of June – says that 422,000 people remain besieged in Syria, down from 440,000 earlier this year. The difference is due to the 18,000 people in Yarmouk, who are no longer considered besieged. The report argues that aid has reached those who have crossed into the neighbouring areas of Yalda, Babila and Beit Sahm, but even that assistance has been cut off since the government withdrew permission on 8 June. Inside the camp, it says, “no humanitarian access has been granted directly” since 28 March. 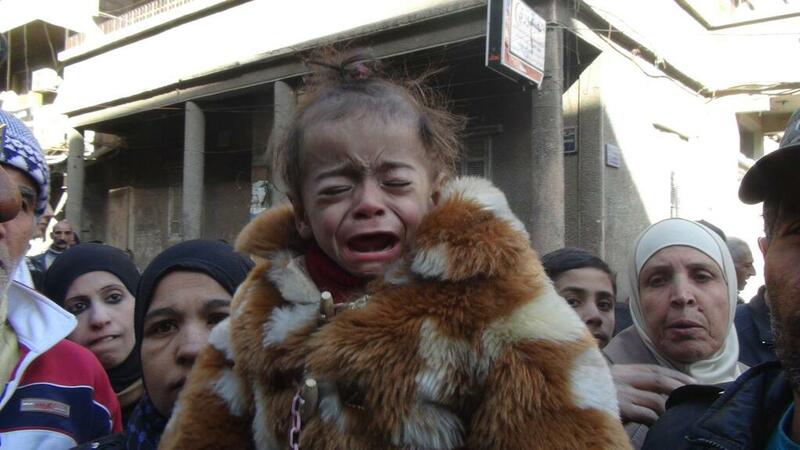 Ahmed told IRIN civilians were unable to leave Yarmouk for fear of arrest at Syrian government checkpoints. The reclassification of Yarmouk – an iconic location in the civil war due in part to a globally shared photo (shown above this story) of thousands of Palestinians waiting for aid – comes as the United Nations faces separate criticism for allegedly underestimating the number of people under siege, particularly those by the Syrian regime. The Syrian American Medical Society Foundation, a US-registered non-profit, released a report in March alleging that more than 600,000 people are under siege by government forces, more than treble the number the UN claimed at the time. The report, which did not include more than 200,000 people under siege by the so-called Islamic State, identified 38 communities it said should be considered, beyond those the UN actually recognises. Valerie Szybala, author of the report, said OCHA has not applied its definition of besieged consistently. The UN relies upon the Syrian government to grant it access to populations in many areas. However, the Assad regime routinely denies permission. So far in 2015, the UN has submitted 48 requests to deliver aid to besieged or hard-to-reach areas. Of these, 20 have been approved and only seven planned deliveries have been fully completed, according to the UNSG’s latest report. Szybala raised concerns of “political influence" in this approach. OCHA spokesperson Amanda Pitt did not comment on exactly why Yarmouk was reclassified. * Name has been changed to protect his identity.